At any given time in the Pop to popism exhibition shop, you’ll usually find two clusters of people exclaiming with joy. One cluster is made up of kids around the toy section. The other is adults discovering the vinyl records for sale. 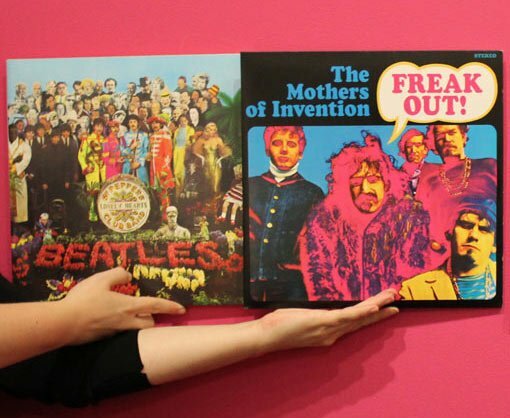 Music – rock n’ roll, soul, glam rock, psychedelia, disco, pop – and album cover artwork were such iconic parts of the countercultural revolution, so Daniel McCready, DVD buyer for the Gallery Shop, was adamant that our pop shop should feature the classic records of the Pop to popism decades. But hang on… does anyone even listen to vinyl anymore? Daniel: You don’t have to just take my word for it but yes, people, including me, do still buy and listen to vinyl as a preferred way to enjoy music, and the response to the vinyl in the pop shop has been extremely positive. What recording artists are represented in the range you’ve chosen? Daniel: Marvin Gaye, Velvet Underground, The Beatles, Syd Barret, Nick Drake, The Beach Boys, Bob Dylan, Aretha Franklin, The Rolling Stones, The Byrds, Ike and Tina Turner, Pink Floyd, James Brown, The Mothers of Invention and many more. Which albums do you reckon have the best cover art? Daniel: The Velvet Underground reissue comes with a faithful recreation the original peel-off banana artwork by Andy Warhol which is pretty hard to beat. All of the recent Beatles album reissues look fantastic. I personally love the cover of Marvin Gaye’s I want you , and Pink Floyd’s new reissues have been packaged brilliantly. There are a fair few gatefold album covers which are pretty special too. Are any of the covers by artists in the Pop to popism exhibition? Daniel: Why yes! Martin Sharp produced two album covers for Cream: Disraeli gears and the sophomore album Wheels of fire . As well as the iconic banana artwork for the self-titled Velvet Underground album, Warhol was behind the camera for the Rolling Stones Sticky fingers cover artwork. All of which we stock in the pop shop, although sadly Sticky fingers is only on CD. I also wanted to get in the seminal live album Alchemy by Dire Straits which uses Brett Whiteley’s artwork of the same name, but it is unfortunately out of print and yet to be reissued. If you wanted to introduce someone to music on vinyl from those years, what would be your one album pick? Daniel: My one album pick would be three albums… that’s allowed, right? In no particular order: The Velvet Underground’s Velvet Underground & Nico , The Beach Boys’ Pet sounds and Marvin Gaye’s What’s going on . Daniel’s now onto his ninth reorder of stock for the show. The records have been so popular, in fact, that due to the high turnover, they’re only available in store, not through our online shop. You’ve still got time to join the turntable crowd, though. Get in to the pop shop before the exhibition closes on 1 March, and let your own vinyl countdown begin!